Studying in another part of the world or country can be a valuable part of your academic journey, and an instrumental experience in further studying human behavior and communication within different cultural contexts. Level-one teacher education courses will need to be completed before studying off campus. Second semester sophomore year or first semester junior year are the ideal times to study off campus. To do this, you should meet with an education professor early in your freshman year. The elementary program is tight and has minimal flexibility, so off campus studies often best fit during May, June and July terms. Spanish majors will be required to study one semester off campus. The secondary education program is also tight, but offers greater flexibility in selection of courses to meet General Education requirements. Secondary students planning to study off campus for a semester should save at least two general education courses to take while they are off campus. Please meet with an education professor as early as possible to work out a plan that might include off campus study. To receive your teacher certification, you’ll conclude your time at Hope with a semester of student teaching. Teacher Candidates who desire a unique student teaching experience may want to consider a placement in an off-campus setting. A number of options are currently available through officially recognized programs at Hope. Some limited, "unofficial" opportunities may also be considered on an individual basis. Hope's Education Department has already established programs in a number of locations including Chicago, Philadelphia, South Dakota and Denver. We have also established a relationship with Interaction International (CCTECC) so that student teachers may opt to student teach in international settings as well. In some additional instances, student teachers may propose distinctive placements in a variety of locations across the United States. Depending on your specialty, track and record of performance, you may be eligible to complete your student teaching off campus at the following sites or other cities and countries around the world. Teacher candidates who wish to student teach in an urban setting, may find the perfect opportunity in Chicago, Illinois. Hope College is part of a long-standing consortium of colleges that arranges for internships and student teaching placements in the heart of the city. Teacher candidates may secure information about this opportunity on the Chicago Semester website. Application procedures and information specific to Education Department requirements are available on the Chicago Semester Informational Sheet. Additional information may be obtained on Hope's campus in the Fried International Center. Teacher candidates who wish to student teach in an urban setting, may find the perfect opportunity in Denver, Colorado. Offered through Northwestern College, Denver Urban Semester provides a cross-cultural experience in the heart of this beautiful city. It provides the student teacher the opportunity to develop a strong understanding of and skills to teach students from a broad range of ethnic and cultural backgrounds. Information about this opportunity is best obtained from the Director of Student Teaching. Application procedures and information specific to Education Department requirements are available on the Denver Urban Semester Information Sheet. 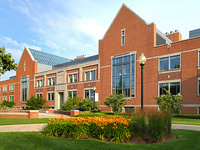 Hope College is part of a consortium through The Philadelphia Center in Philadelphia, PA. Besides managing internships for a range of disciplines, the Philadelphia Center also offers student teaching placements in this historic city. Teacher candidates may secure information about this opportunity on The Philadelphia Center website. Application procedures and information specific to Education Department requirements are available on the Philadelphia Center Information Sheet. Hope's Education Department has a longstanding relationship with the Rosebud Indian Reservation in South Dakota. Besides offering May Term opportunities on the Reservation, some teacher candidates may wish to experience life as a student teacher in this unique setting. Teacher candidates considering this option MUST participate in a 3-week May Term on the Rosebud Reservation prior to student teaching. Information about the May Term and student teaching may be obtained by contacting Susan Cherup or the Director of Student Teaching in the Education Department. Application procedures and information specific to Education Department requirements are available on the South Dakota Semester Information Sheet. Teacher candidates desiring placements outside of the traditional placement radius from Hope, have, at times, proposed placements in a variety of locations, including other parts of Michigan, California, Colorado and Illinois. Each of these proposals has been presented to and approved by the Education Department on a case-by-case basis prior to beginning the placement process. These placements are in no way guaranteed, though, and rely on the Education Department's ability to partner with a local teacher education program and receive assurance that all requirements for the student teaching experience and teacher certification can be met through the placement. The Education Department limits the number of applications accepted through this option. Information about this possibility is best obtained through the Director of Student Teaching. Application procedures and requirements are available on the Off-Campus Student Teaching Information Sheet. Teacher candidates interested in fulfilling the student teaching placement in an international setting will work through the Education Department, as well as an outside agency, Interaction International. Specific information about student teaching abroad through Interaction International can be found on their website under the CCTECC program section. This organization has a long and successful history of placing student teachers in schools around the world. In addition to adhering to Hope’s placement requirements for student teaching, Interaction International also provides extensive orientation activities over and above Hope’s orientation session. Information about this opportunity is best obtained from the Director of Student Teaching in the Education Department. A registration fee is required for the placement process, though this is refunded to the teacher candidate's account once s/he commits to the placement. Application procedures and information specific to Education Department requirements are available on the International Off-Campus Student Teaching Information Sheet. Learning the difference between the ghost dance and the sun dance of the Lakota Sioux is good for an increased cultural awareness and for the spirit. When the two are mixed, they define your experience on the Rosebud Indian Reservation, located in south-central South Dakota. This May term has been an option for the past 25 years, and students love it. The Rosebud Reservation in South Dakota provides an opportunity to learn about the history and culture of the Lakota Sioux as well as work in the Todd County School district or health care settings. Trips to Wounded Knee, Crazy Horse, Black Hills, Mt. Rushmore, and the Akta Lakota and St. Francis museums provide further information about the Sioux Nation. The application can be found on the Center for Global Engagement program brochure. For more information please contact Susan Cherup or James Piers. This is a three-week experience in Los Angeles, California, at the Watts Learning Center, an award-winning urban charter school. Your time will include daily classroom experience and additional experiences in the greater Los Angeles area. The application can be found on the Center for Global Engagement program brochure. Contact Nancy Cook or John Yelding for more information. While in Liverpool, you’ll reside and board at Liverpool Hope University, a sister college with which Hope has had a long and fruitful relationship. You will teach in British schools and take courses from Hope professors. The city of Liverpool served as the “2008 Cultural Capital of Europe” and provides many off-campus activities. Additionally, you will take weekend trips to London and Edinburgh, Scotland, which includes an excursion to the Highlands. The application can be found on the Center for Global Engagement program brochure. If you would like additional information please contact Tony Donk, Laura Pardo or William Moreau. This June Term combines classroom study with a road trip throughout the South to visit critical sites in the Civil Rights Movement of the 1950s and 1960s. View the program brochure, and contact John Yelding for additional information. After graduation, you can still learn and partner with off-campus organizations that focus on education. You can serve with YWAM on an outreach trip, as a student, or as a staff member or volunteer. To join as staff, you must first complete a Discipleship Training School (DTS), which is offered in over 200 locations around the world. YWAM has no centralized application process. Although YWAM does have main offices, we encourage you to contact our field locations directly for details about applying, schedules and costs. Whatever way you want to serve God, you can most likely do it in YWAM. Being on staff with YWAM is an adventure in faith. Join staff for a couple of years, or stay for life. The core Fulbright U.S. Scholar Program provides approximately 800 teaching and/or research grants to U.S. faculty and experienced professionals in a wide variety of academic and professional fields. The competition for academic year 2017–2018 is now open. More information on how to apply can be found on the Crossroads website.